It uses SpamAssassin for Spam scan and Amavis & Clamav for Mail virus scan. 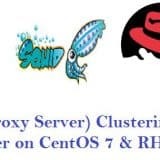 In this article we will demonstrate how to install and configure iRedMail on CentOS 7 & RHEL 7. I am going to use followings for iRedMail setup. Note : In case if you want mails from your mail server to be delivered in inbox not in spam folder then update the DNS records like A & PTR before installation and TXT ( SPF & DKIM ) after installation. 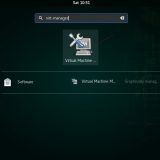 Step:1 Set hostname and disable Selinux. 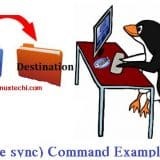 Set the proper hostname using hostnamectl command if it is not set. Edit the file /etc/sysconfig/selinux , set the parameter “SELINUX=disabled” , Reboot the server to disable selinux completely. Step:2 Download the tar file of iRedmail. 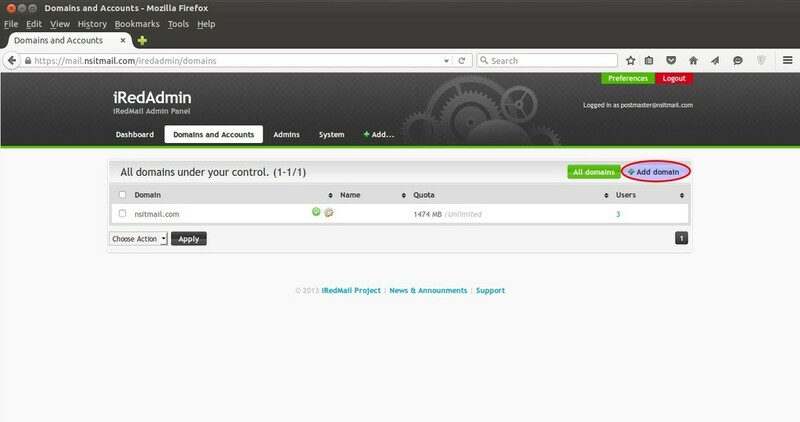 Download the latest version of iRedmail from their Official Web Site or use below wget command to download from terminal. Step:3 Extract the tar file & execute installation Script. After couple of seconds , below screen will appear , Select yes and press enter. 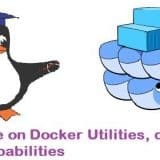 Define the folder or directory where users mailbox will be stored. 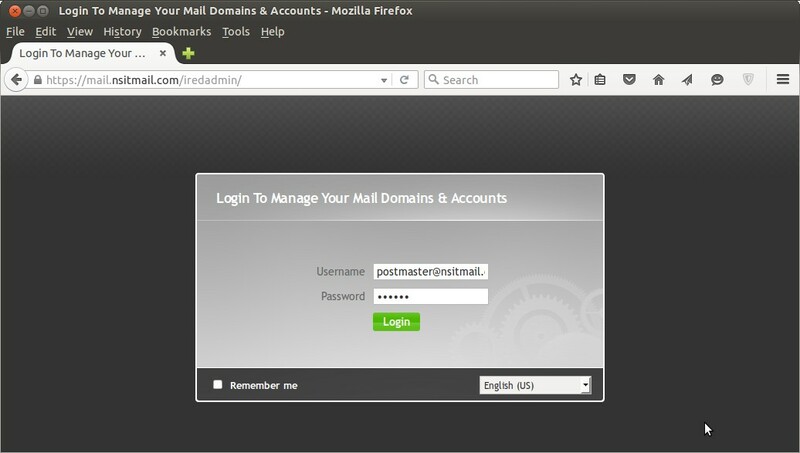 Select the web Server for iRedmail. 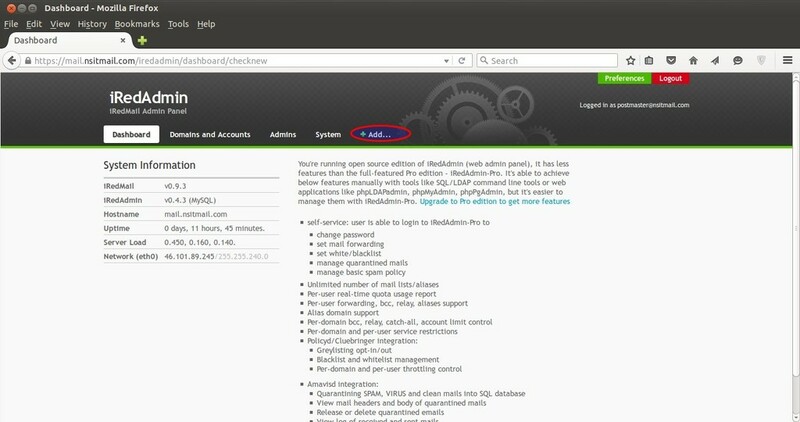 Default is Nginx. 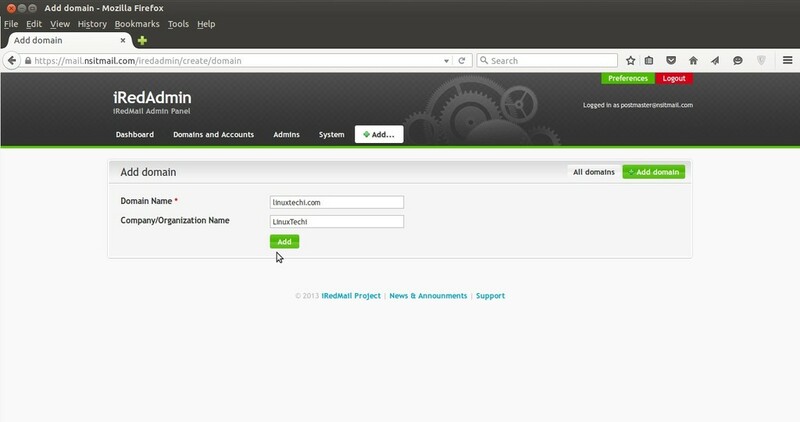 Select the database of your choice which will store domain names and mail accounts. In my case i am using MariaDB. Set Password for postmaster account. 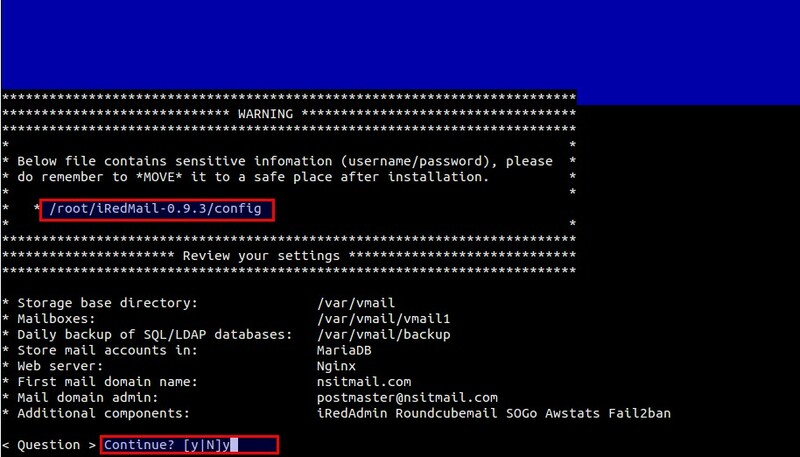 Press “y” to continue installation, Mail Server info & Credentials are kept in the file “/root/iRedMail-0.9.3/config”. Please keep this file in secure place. As per instructions , reboot the server to enable all mail services. Postfix mail logs and iRedmail logs are stored in “/var/log/maillog” and “/var/log/iredapd/iredapd.log” respectively. Following are the Important URLs after the Installation is completed , replace the domain name as per your setup in mentioned URLs. Step:4 Create Users & domain from Admin Panel. 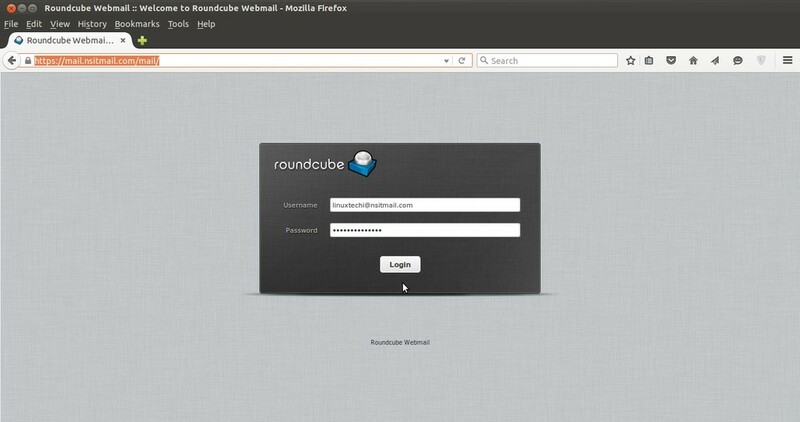 To create users first login to admin panel. Use user name as “[email protected]<domain>” and password that we set during installation. Click on Add option and then Select Users. Define the domain name & Organization Name and then further we can create users on newly created domain. 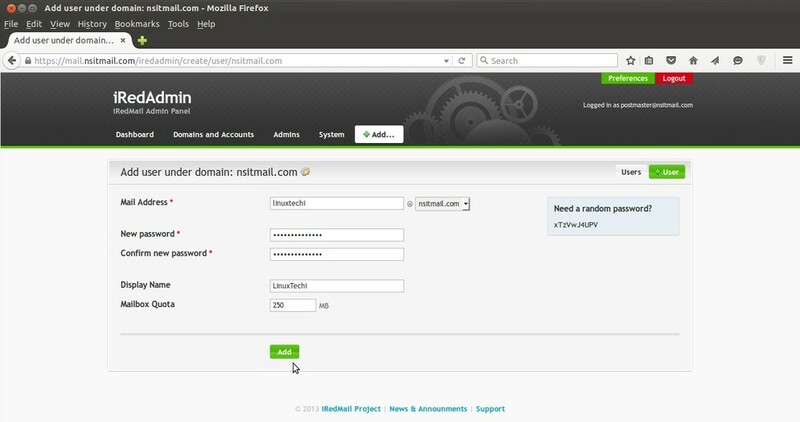 Open the url in the browser “https://mail.nsitmail.com/mail/” , replace the domain name as per your setup. Send a test mail to verify the functionality. As we see that i got the mail from iRedmail mail server, so we can say the iRedmail is successfully installed and configured. thank you for your efforts but i have a problem when i wont to get to mail.nsitmail.com/iredadmin / i do not get the page of login that you’ve shown us. 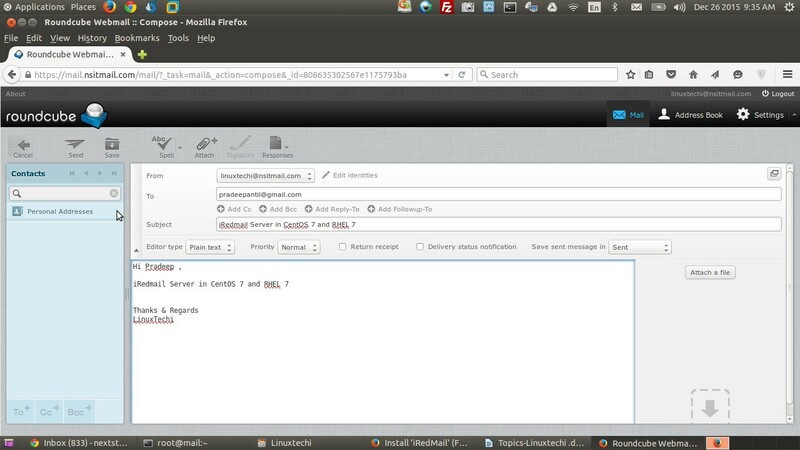 Currently I have set the iredmail on local centos 7 server and its working fine. Now I have domain purchased. Now How can I configure the mail server for that domain. I have one static IP as well. But currently used that IP to different server. Also let me know if any IP forwarding required for that as currently that is running on local centos 7 server. 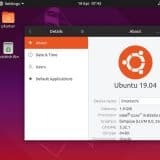 Please help me to configure. Add a Domain in your iredmail server from admin panel and assign the public IP address to your server and add a firewall rule in such a way that if any request comes on 25 port on your public IP it should redirect the request to server’s local ip. From your Domain Panel, configure DNS records like A, PTR and MX. mail.musicout.com’s server DNS address could not be found. It seems like DNS records for your sever’s hostname ‘mail.musicout.com’ is configured properly. In your DNS server do A record entry of your mentioned hostname. In Case DNS server is not configured then do below entry in your system host file. I currently install the iredmail on the local centos 7 server and it works fine. Now I have acquired domain. How can I configure the mail server for that domain. I have a static IP and it also publishes. 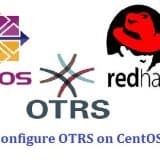 I would also like to know how I could run it on the local centos 7 server. Please help me set it up. Hi This was really useful . Thank you and I am planning to change my exchange server and use this as my mail server. Domain is active and I have the public IP configured . A firewall rule to point my exchange server is already there . So if I just create a same domain name and set the IP of my exchange server to this server, will everything work ..?? It should work, please make sure all users are created on the domain as well. 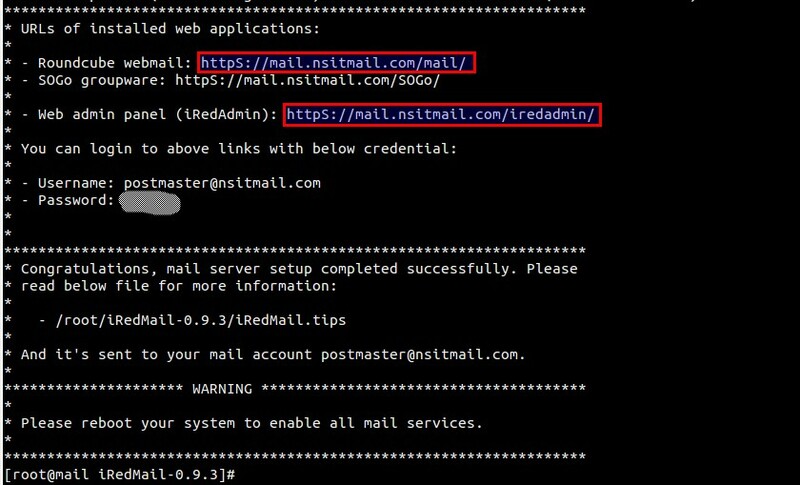 – is your iredmail installation successful…? – Update your server’s hostname either in DNS or /etc/hosts file. I have installed iRedMail and I can send email without any problems but I can’t receive email. Would you happen to know of any reason this could happen? Configure the MX record for your domain in the DNS and also make sure user exists on your mail server. 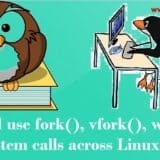 Hi I installed the server following this tutorial. It worked perfect for last 6 months . But 2 days ago the end user told he gets thousands of Mail Delivery Failure messages being sent to his mail box. I suspect my server is sending lots of spam emails out and I get the logs saying my IP is black listed. 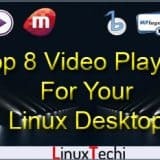 I am planning to reinstall everything but how do I secure from the spam attacks again..? What about SpamAssassin ?? Will this prevent this..?? Configuring the linux firewall will help..?? Please please advise. It looks like one of the system from LAN is sending thousand of emails or spam emails to your mail server. This usually happens because of virus, check the email headers , there you will find the IP address of the affected system, disconnect it from the LAN and delete all emails from the queue. 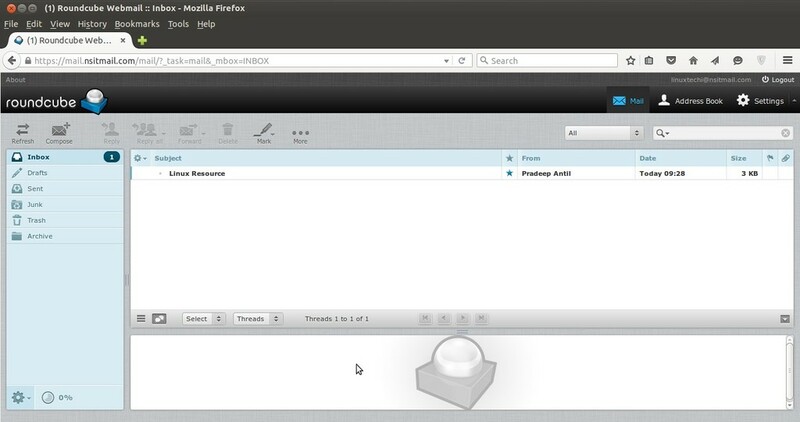 Try to whitelist your mail server public IP by sending whitelist request via portals. Enable & Configure SpamAssassin on your mail server and configure Linux firewall only if there is no hardware firewall in your env and allow only specific ports.